Strawberry its one of gods wonderful creation. It has sweet fragrance and when it is blended with milk gives yummy milkshake. Packed with vitamins, fiber, and particularly high levels of antioxidants known as polyphenols, strawberries are a sodium-free, fat-free, cholesterol-free, low-calorie food. The heart shaped fruit is the first clue that this fruit is good for us. 1. Blend the above ingredients in the blender. 2. Serve it with ice cubes. 3. Refreshing yummy shake is ready to serve. 4. 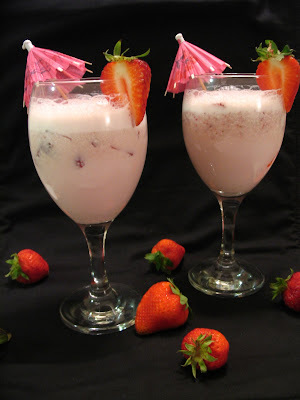 Because of slight sounrness of strawberry the milk will start changing its texture so serve immediately. But it does not affect the taste. 5. Instead of strawberry preserve you can use sugar too. 6. Here I have added small bits of strawberries in the milkshake. Can I have one glass please..:)Perfect drink for this hot summer day! !Looks very refreshing by seeing it itself..
Lovely color and the cute lil umbrellas say its party time!!! Anni it looks AMAZING. The lovely little umbrellas looks so so so cute. I was looking for mine down the entire house today.. and I was seriously happy to see urs. The decoration is damn good. :) yummy it looks.. Wish i was there today.. actually everyday ;) ha ha.. keep it going..
cute pics.. looks very nice. wish it was here! I want a sip!!! Looks soooo good! 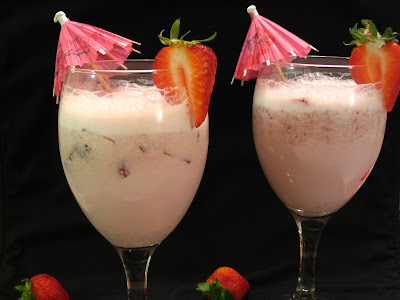 Wow, wonderful presentation.. refreshing drink !! Thanks everyone for your sincere comments. u surely know how to present things!!! !